Mid-Life Cruising!!! : Fins, Sails and Fans! While Ken and I did not forget our fallen soldiers on Memorial Day, we did enjoy our 3-day weekend! We kicked things off on Saturday with a drive to the Mississippi Gulf Coast. 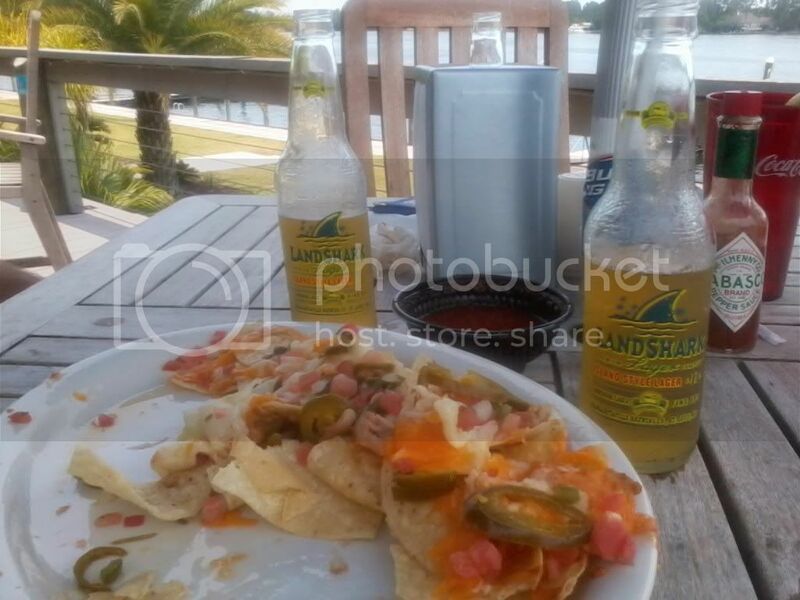 Our first stop was in Gulfport at "The Dock" for lunch and a few Landsharks. We had never been to "The Dock" before, but we had a gift card and it's located on a lake ... that was all the incentive we needed! We enjoyed the view, as well as the nachos! Since we were all about relaxation that day, we stayed a couple of hours and also enjoyed a serving of barbecue shrimp n grits ... really good stuff! 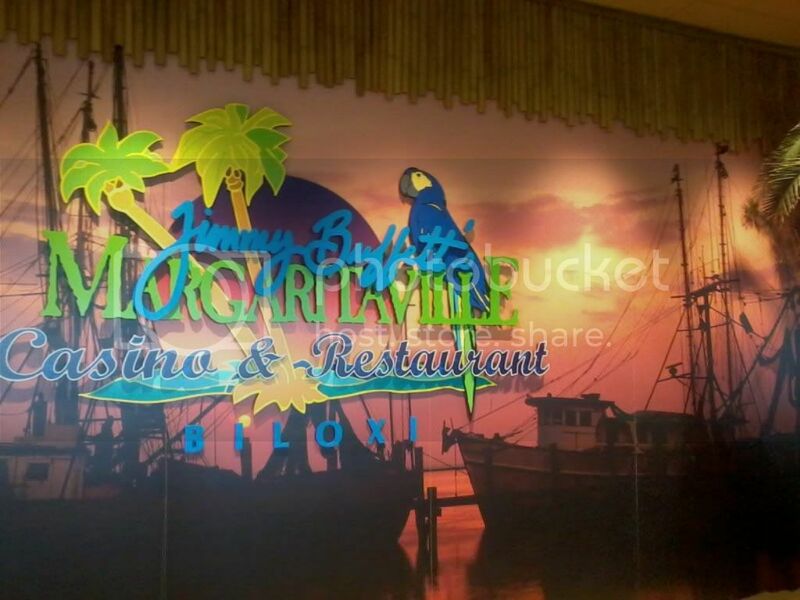 Afterwards, we headed down the coast towards the new Margaritaville Casino in Biloxi. The ride along the beach was great, and we wished we were in a Jeep or a convertible. 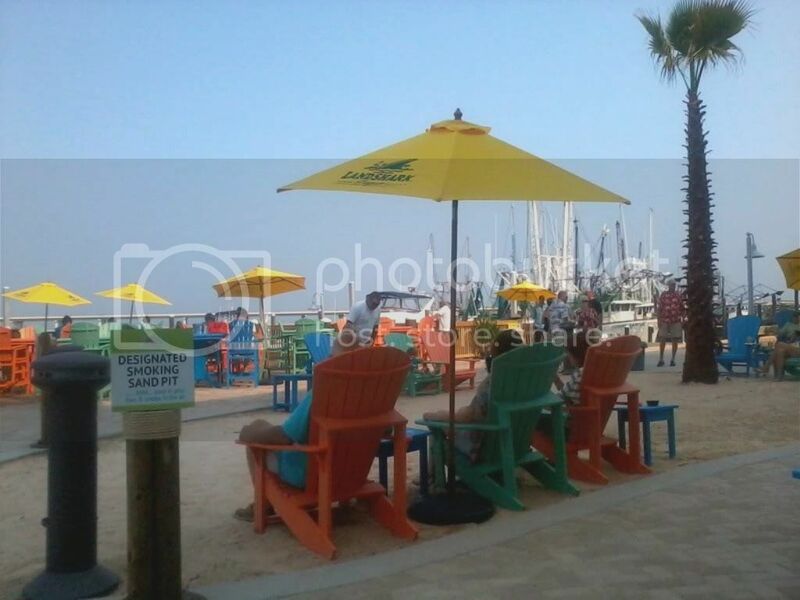 The beach was full of people enjoying the day, and all of the colorful flags and umbrellas provided a festive view. 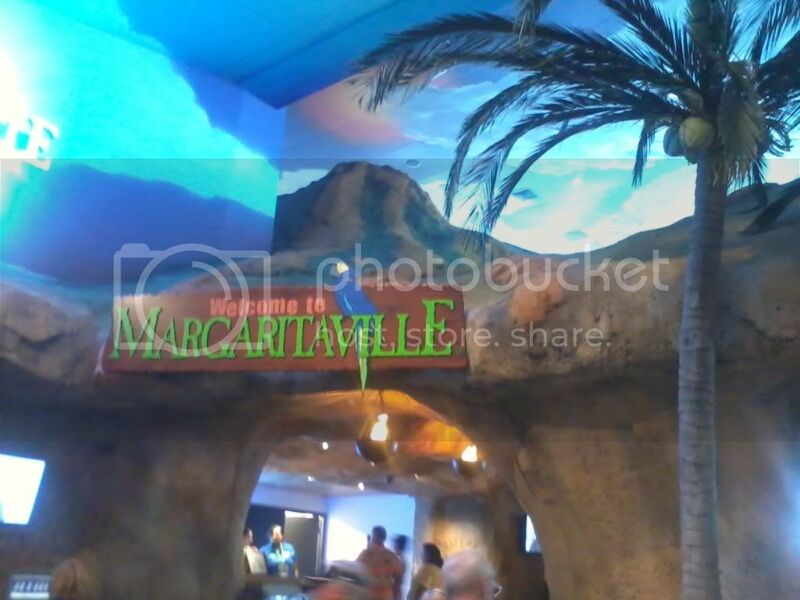 We arrived at Margaritaville and checked out the casino area and restaurant first. 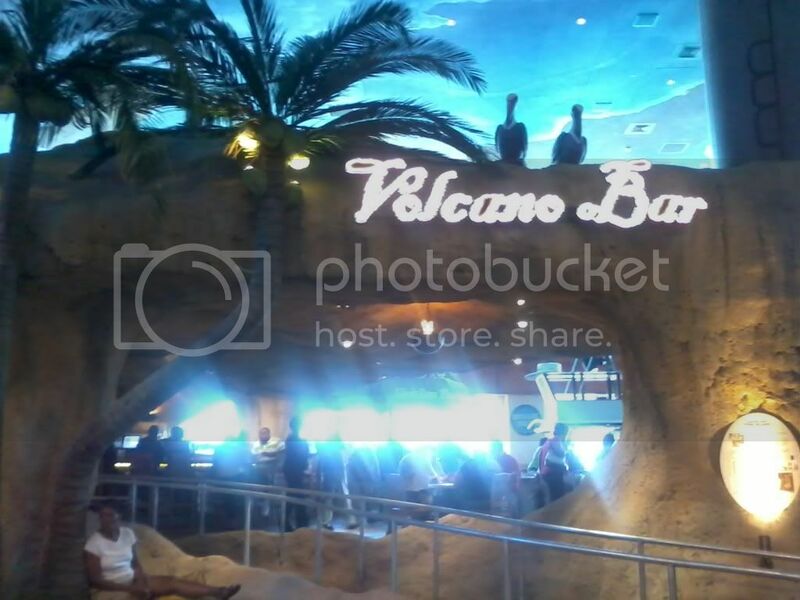 Like the Margaritaville we saw in Las Vegas, the restaurant had a "volcano" and a margarita glass that an "island girl" would slide into every half hour. 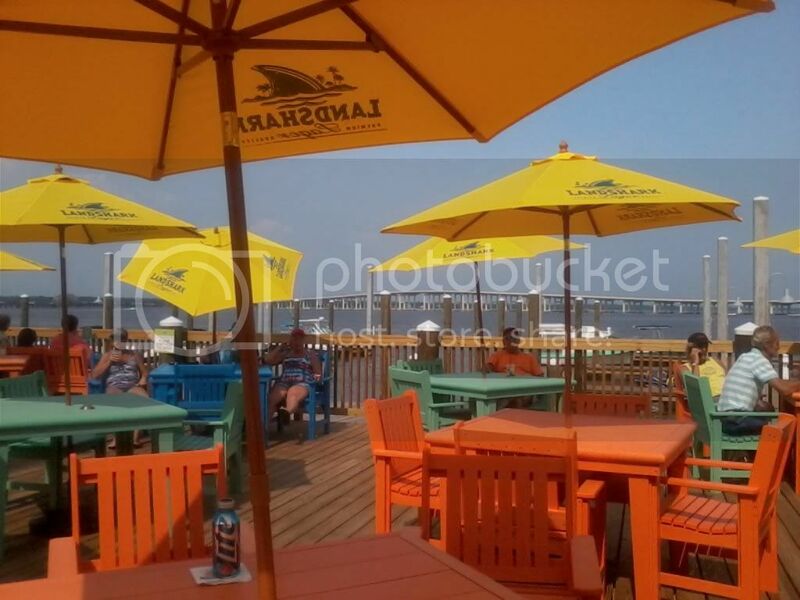 The tables looked like wooden boats, and there was a great view of the bay! 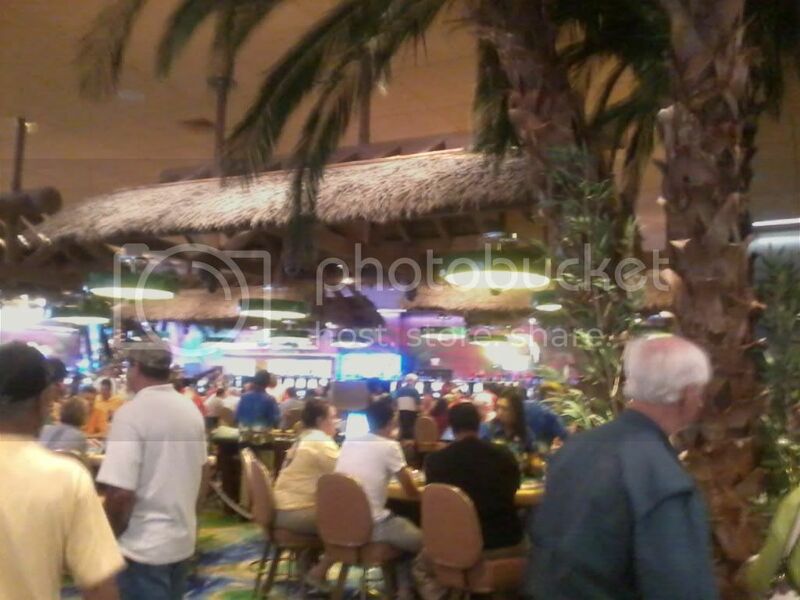 The casino had that lively tropical feel that you would expect from Jimmy Buffett. The gaming tables had thatch roofs, lime slices for the lights, and palm trees throughout the area. We'd say that although this casino is smaller than some on the coast, it's definitely the one we like the best! Afterwards, we headed out back to the outdoor patio and marina. This area was really nice! There was live music, a bar, lots of brightly colored tables with "Landshark" umbrellas, a few food trucks serving crawfish, sandwiches, burgers and ice cream ... this is something the other casinos nearby don't have! 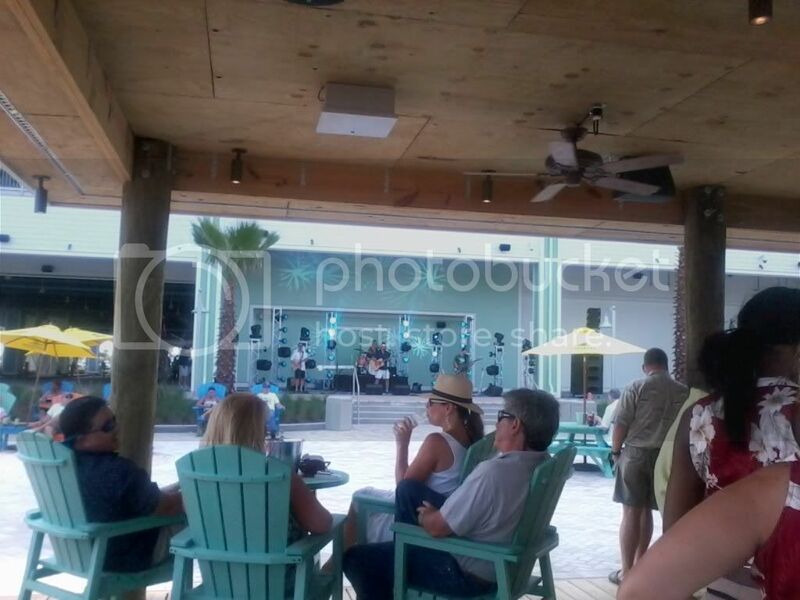 The marina is small, but it does have electrical hook-ups and has a great view of the band and the outdoor patio since it's only steps away. Ken and I grabbed a chair and enjoyed the band while talking about how nice it would be to sail Nirvana to the casino, stay overnight, and enjoy the area. We figured that we'd need one day to sail to Ship Island, then another 5 or 6 hours the following day to sail to Margaritaville. This would be a nice shakedown cruise! Sunday we took Nirvana sailing, which seemed to be way overdue! I couldn't remember the last time we actually raised Nirvana's sails, and after looking at our posts I realized it was back in November! A good friend of ours, Judy, joined us and we had a great and relaxing day. The winds were light, so we were able to just leave the sails alone and slowly glide along the lake while listening to music and having a few drinks. Judy showed up with some really nice wine glasses for Nirvana that won't break ... what a nice gift that we immediately enjoyed! After a while, Ken lowered the sails and fired up the grill! With such light winds we didn't even bother with dropping the anchor, and while the grill was heating up we all jumped in the lake with our "noodles" to cool off. We had a rope that we held on to so we wouldn't float away, and once we were back in the boat we enjoyed some burgers. They seem to taste so much better on the boat! I can't believe it ... I didn't take any sailing pictures! Oh well ... I think we were so relaxed that I just didn't think about it. But, we did have a great day and I think Judy had a good time too! Monday ... and no alarm clocks going off! It was so nice to have an extra day to just "chill". Ken and I did run some errands and move a hauling trailer that he needed for work the next day, but it was still a day "off". We did run a "fun" errand, which was to stop by West Marine and use our $30 worth of coupons that we'd been holding on to. Being a member of their buying club, we had earned these coupons a while back when we purchased our Lowrance chartplotter from West Marine. The coupons were about to expire, and the Caframo fans that I'd been having my eye on were on sale. Between the coupons and the sale, we were able to get two fans for a really great price! Ken wasn't familiar with these fans, so he trusted me with this brand ... I hope they keep us cool while staying on Nirvana! I'd love to hear your thoughts on these fans. On another note, I haven't quite finished my Virgin Islands vacation posts ... I'll have a post about our last day sometime this week. In the near future, I'll also post some of my overall thoughts about the islands and sailing to them on Nirvana someday. Oh, and I've got a really good cocktail recipe that I picked up while on St. Thomas ... "Moonlight Sail"! Leslie, enjoy your time on the Jersey shore .. sounds great! I don't know if we'll make it up North, but we'll definitely be sailing in the South and looking for you! Cathy, you're right ... sometimes a camera gets in the way of the moment!